A webcam on a stick that follows you around that is what you want and that is what Logitech is offering to you with the QuickCam Orbit AF. This Webcam comes on a stick so that it is at Eye height and because of the build in motors it will keep you in the middle of the picture even if you move around. And as you can expect from Logitech products it has the latest gadgets build in. HD recording 960×720 at 2 megapixel quality (8 Megapixel for photo’s) and great auto focus to keep you sharp when you are chatting away with this great piece of technology. Of course Logitech offers you a load of software that make it more fun for you to use the webcam and with the build in microphone you can easily start making some home movies for Youtube or just your friends. And if you order a Logitech webcam between now and the end of March 2009 on the Logitech website and use the code BETHERE you will get 15% discount. 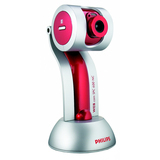 So if you are even just thinking of a new webcam go see the QuickCam® Orbit AF and order today! We all want to be the next James Bond but with these cool UV400 polarized sunglasses you can be. These cool looking Sunglasses have a build in 1.3 Mega pixel camera (1280×1024) and 1 GB of storage so now you can secretly take pictures of anything in sight. The included remote will make you take the picture. And if for when you are not on a spy mission the Sunglasses also play MP3’s just put the ear buts in your ears and you are ready to enjoy the music. Check out all the cool features of the Spy Camera Sunglasses at ThinkGeek.com . I think this web cam looks hot, what do you think? Philips made this nice little camera to make it more fun for you to chat with you buddies on MSN and to have more fun gaming. To do this of course Philips made this Webcam look nice and i have to say much nicer then most other camera’s out there. And to add some fun they included some games that will include you in the game you are playing. If you don’t have a web cam yet then this time of year is the one to get you own personal webcam. Isn’t it fun to show your far far away friends you xmas tree and do a little bit of video chatting with all your friends that are out of town? I think that it’s probably the best time of year to have your own personal web cam. And I just ran in to this little fellow., the ZoomCam 1598 is a web-cam for less then 10 dollars and it even has a build in microphone. It comes with everything you need to get started and you can even clip it on to your laptop. 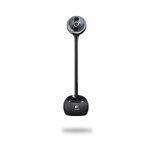 Check out the ZoomCam 1598 USB Full-Color Web Camera w/ Built-in Microphone today and start video chatting this holiday! Isn’t this the coolest thing you ever saw 🙂 A cover for around you computer screen that looks like a bear. And you know that is not just it, the bear has a web cam build in to it’s nose so you can webcam with your friends and they don’t have to know what you have around you computer screen. Need a new Web Cam then think of this little Garfield one. It definitely looks nicer then the Same old ugly web cams that you normally see. And i bet you that people will notice it on your desk. Look at Brando for more information about the Garfield web cam! If you are looking for a different looking webcam then maybe Cooper can help you. Cooper is a friendly yellow toy dog with a usb cable instead of a tail and a camera in his nose. Cooper also has a friend called Donut just in case you don’t like this yellow version. Donut is white and has more hairs.